Zombies evolved, or just the resurrection of a rotten old corpse? So it was with no small amount of trepidation that I fired up Dead Rising 2, the sequel to Capcom’s promising-but-flawed early Xbox 360 game. Would it fix the problems of the 2006 original? Would Canadian sports game dev Blue Castle be a good fit for a bonkers zombie massacre? Would the four year-old concept still be fun at this stage? Yes, yes, and yes, are the answers, with a few noteworthy caveats. Read on for the full, gore-filled picture. It’s an undisclosed period of time after the Willamette zombie outbreak of the first game. You play Chuck Greene, a father who’s visiting Fortune City – a thinly-disguised parody of Las Vegas – in order to compete on Terror is Reality, a zombie-slaying game show that has emerged as a reaction to the spreading infection. He’s here to win money in order to pay for his young daughter Katey’s Zombrex treatment, Zombrex being the new drug released to suppress the effects of zombie bites in newly infected victims. Yes, she might be an angelic – and surprisingly well-acted – pre-teen, but unless treated every day, Katey’s tantrums will have your face off. In a turn of events as surprising as the way last night turned out to be a bit dark, the show’s stock-pile of conveniently dismemberable reanimated props breaks loose. Publicly framed for releasing the feral gut-munchers, Chuck takes Katey and seeks refuge in the large communal safehouse attached to Fortune City’s main entertainment complex. But with no military help coming for three days, and that help liable to arrest whatever’s left of Chuck after it’s shot the living crap out of him, he will have to venture out, combating and evading zombies at every turn, as he attempts to clear his name and forage a daily Zombrex supply for the little one. In essence then, a lot like that day I got banned from Bristol zoo, except that zombies are less cute than spider monkeys, but possibly slightly funnier. And I was guilty as charged, but in my defence, pretty drunk. 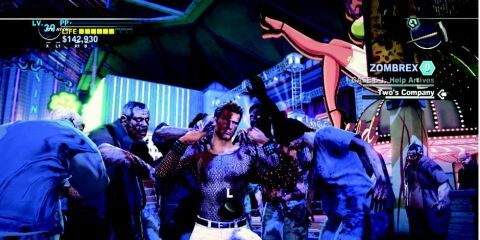 This being a Dead Rising game rather than a Resident Evil entry, the emphasis is on laughs and excess rather than the po-faced drama of man against corpse, conspiracy and over-sized boulder. Think Return of the Living Dead rather than Romero. Actually, think Shaun of the Dead, because DR2’s creative splatter comedy is tempered by a strange mix of genuine emotional hooks (via Chuck’s relationship with his ailing daughter) and schlocky exploitation (via some grim events and forthright breasts). It’s a tonal mix that shouldn’t hold together, but perhaps because of the already-heightened reality of the Vegas-style setting, it actually manages to work. More of the same, but better? On first glance, Dead Rising 2 doesn’t differ a great deal from the formula of the original game. Or on the second. Or for that matter, on glance number three. You find yourself in a mini open-world made up of contrasting but connected areas, all of which are packed out with shambling, stinky offal-scoffers. The game’s story plays out over a three-day period in accelerated game time. Over the course of those three days you’ll be given a series of compulsory story missions and a boatload of optional ones. All missions need to be completed within a certain time after their announcement or they’re gone forever, and failure to complete a story mission results in a stout booting back to your last save point. But while all of that remains the same, one simple but fundamental change makes a big positive difference. The original game’s notoriously brutal manual game-save system has been softened to allow three save slots. The game still forces a studious survival instinct, demanding diligent play by offering nothing in the way of auto-save functionality, but this time around a gross mistake in timing – say, hitting a hard compulsory boss fight with crap weaponry and no time to get better kit - doesn’t force a total restart. As such, you can enjoy Dead Rising 2’s hilarious gratuity without the constant fear that a sudden difficulty spike could send you right back to the beginning. Masochists may be disappointed, but everyone else can rejoice. Most of the time. But that’s not the only welcome improvement. The zombie apocalypse descends on Fortune City, and the hard-edged Chuck is caught in the middle.